The purpose of this set is to improve service learning research and practice through strengthening its theoretical base. Contributing authors include both well-known and emerging service learning and community engagement scholars, as well as scholars from other fields. The authors bring theoretical perspectives from a wide variety of disciplines to bear as they critically review past research, describe assessment methods and instruments, develop future research agendas, and consider implications of theory-based research for enhanced practice. This set constitutes a rich resource that suggests new approaches to conceptualizing, understanding, implementing, assessing, and studying service learning. Each chapter offers recommendations for future research. 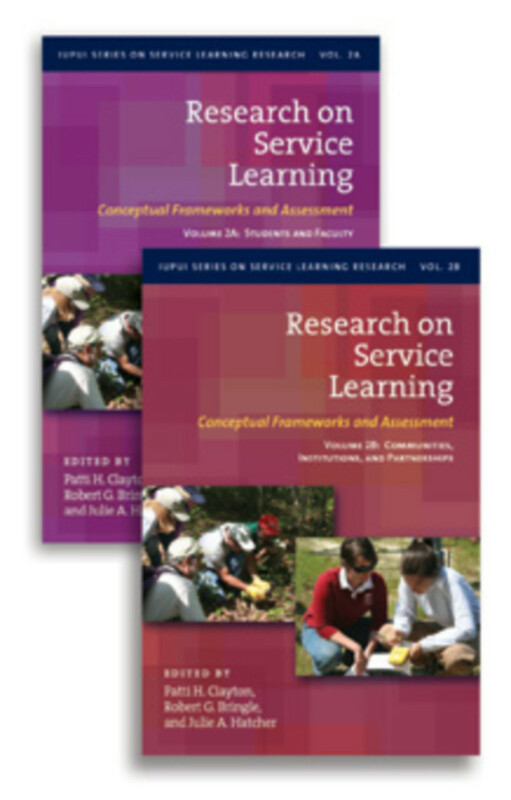 Research on Service Learning: Conceptual Frameworks and Assessment will be of interest to both new and veteran service learning instructors seeking to enhance their practice by integrating what has been learned in terms of teaching, assessment, and research. Staff and faculty who are responsible for promoting and supporting service learning at higher education institutions, evaluating community service programs, and working with faculty to develop research on service learning, will also find this volume helpful. For scholars and graduate students reviewing and conducting research related to service learning, this book is a comprehensive resource, and a knowledge base about the processes and outcomes of innovative pedagogies, such as service learning, that will enable them to locate their own work in an expanding and deepening arena of inquiry. Both volumes open with chapters focused on defining the criteria for quality research. Volume 2A, then begins with research related to students, comprising chapters that focus on cognitive processes, academic learning, civic learning, personal development, and intercultural competence. The concluding faculty section presents chapters on faculty development, faculty motivation, and faculty learning. Volume 2B addresses community development, and the role of nonprofit organizations in service learning. It then focusses on institutions, examining the institutionalization of service learning, engaged departments, and institutional leadership. The final section on partnerships in service learning includes chapters on conceptualizing and measuring the quality of partnerships, inter-organizational partnerships, and student partnerships. Both volumes are also available separately. Patti H. Clayton is an Independent Consultant (PHC Ventures) and serves as a Senior Scholar with the Center for Service and Learning at Indiana University–Purdue University Indianapolis, a Visiting Fellow with the New England Resource Center for Higher Education, and a Visiting Scholar at the University of North Carolina at Greensboro. Patti co-developed with students and faculty a leading critical reflection and assessment model (the DEAL Model), models for student leadership in service learning, and a variety of faculty development and curriculum development processes. Patti is a Board member of the International Association for Research on Service-Learning and Community Engagement and serves as a Co-Editor of the Association's annual conference Proceedings; she is also an Associate Editor of the Michigan Journal of Community Service Learning, and she serves on the Editorial Board of the Journal of Applied Learning in Higher Education. Robert G. Bringle is Chancellor’s Professor Emeritus of Psychology and Philanthropic Studies and Senior Scholar in the Center for Service and Learning at Indiana University Purdue University Indianapolis. From 2012-2015, he was the Kulynych/Cline Visiting Distinguished Professor of Psychology at Appalachian State University. He was the Executive Director of the Indiana University Purdue University Indianapolis Center for Service and Learning from 1994-2012. Dr. Bringle was awarded the Thomas Ehrlich Faculty Award for Service Learning, the IUPUI Chancellor’s Award for Excellence in Teaching, and the Legacy of Service Award from Indiana Campus Compact. In 2004, he was recognized at the 4th Annual International Service-Learning Research Conference for his outstanding contributions to the service-learning research field. The University of the Free State, South Africa, awarded him an honorary doctorate for his scholarly work on civic engagement and service learning. Julie A. Hatcher is Associate Professor Emeritus of philanthropic studies in the Lilly Family School of Philanthropy at Indiana University Purdue University Indianapolis (IUPUI). From 2012-2018, she was executive director of the Center for Service and Learning and associate professor. Julie serves as co-editor of the IUPUI Series on Service Learning Research (Stylus, 2011, 2013, 2016). Her research focuses on the role of higher education in democracy and civil society, civic learning outcomes in higher education, philanthropic studies, and civic-minded professionals. She serves on the national advisory board for the Carnegie Foundation’s Community Engagement elective classification. Julie is the 2017 International Association for Research on Service-Learning and Community Engagement Distinguished Career Award recipient, and the 2008 Dissertation Award recipient. Julie earned her PhD in philanthropic studies with a minor in higher education at Indiana University.